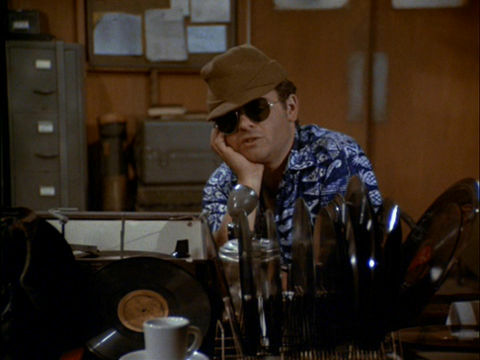 Capsule Summary: Radar learns to spin vinyl to keep up morale during a deluge. I think I know at least one regular visitor to this site who really likes this episode, or at least Radar’s DJ persona of Big Daddy O’Reilly. And with good reason. This is an excellent episode with a lot to praise and very little to criticize. It’s may not be laugh out loud funny from start to finish but everybody has a role to play plus it features Double Cranko. Parts of this episode are vaguely reminiscent of Season 2’s “Crisis” in which many characters were forced to bunk together due to supply lines being cut. That’s about as far as the similarities go, however. “Your Hit Parade” doesn’t dwell as much on sleeping arrangements, with the obvious exception of poor Charles. There are four distinct plot lines, including Radar the DJ, the drunk bomb disposal sergeant, Charles looking for a place to sleep, and Colonel Potter’s sentimental journey. I’ve made comments in the past about feeling uncomfortable watching certain episodes in which Radar is depicted as particularly naive or innocent. This isn’t one of those episodes. His evolution over the course of just 25 minutes from a confused company clerk trying to raise morale by playing records to a cool cat disc jockey is hilarious. Watching Charles wander the compound dragging around his cot trying to find a place to sleep is likewise enjoyable. I particularly like how he dropped his cot across Hawkeye and B.J.’s cots in Colonel Potter’s tent only to leave in a huff when they put their feet over him. We never learn if he finds a place to bunk down for the night. He’s not seen again once he leaves Margaret’s tent. This episode is notable because the writer, Ronny Graham, also made a guest appearance as the drunk Sergeant Gribble. Graham also served as Program Consultant during Season 6 so he actually receives three different credits in this episode. I wonder if there’s a good story about how he got a role in the episode. This was the first of seven episodes Graham wrote. During Season 7 he became Story Consultant and he remained with the series in that role until halfway through Season 8. Interestingly, despite hearing “Sentimental Journey” three different times during this episode, we never once actually hear Doris Day singing, only the orchestra playing. I have always enjoyed this episode and voted for it in the Season 6 episode poll. There are really no holes in this episode and I agree that it is nice to see Radar being something other than naive and innocent. His DJ lingo fits the stereotype of DJ’s from the time “time to put a new fang in the old tone arm cobra” (changing the record player needle)). This is historically accurate from a technical standpoint. 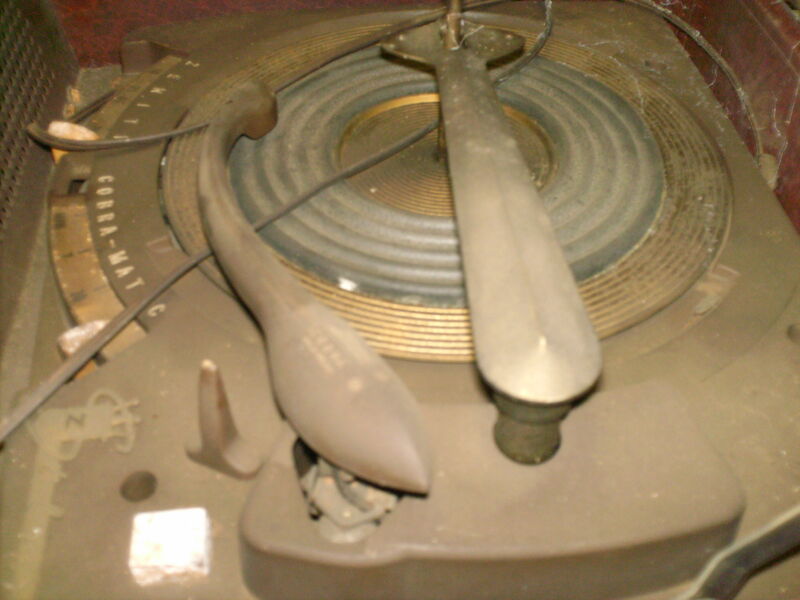 In the late forties Zenith developed the “Cobra-matic” record player which used a modulated FM signal rather than the normal phono cartridge; this proved so noise free that Wurlitzer licensed it for use in their jukeboxes of the era. The tone arms of these systems (home or jukebox) were a stylized snake shape, tapering from the pivot to the end, which flared out like a snake head; there were even two embossed gold “eyes”. The system was comparatively complex, needle replacement was tricky, and advances in cartridge and amplifier design rendered it obsolescent by the late fiftes. I haven’t seen this episode recently (don’t particularly like it), but if you actually see the tone arm and it isn’t that snake shape (almost always black), then Radar doesn’t really have a “Cobra” . So yeah, for me, this is Radar’s finest moment of the entire series, and like Crabapple Cove, I too voted for this during the Season Six poll (big shock). Definitely not much to criticize about this episode; one of the best entries from IMO a very strong season in general. Never get tired of this one! Ronnie Graham was one of two guest stars on “M*A*S*H” to also write a episode in which they appeared in. The other was Mary Kay Place in “Springtime”. I especially loved Radar’s DJ persona. He was, in my opinion, Korea’s answer to Alan Freed. MARGARET: Frank? I beg your pardon? Radar: And a big hello to all you daddy-o’s, mommy-o’s, and NCOs from Big Daddy O’Reilly. Quite possibly Radar’s best line from this episode. The “And I thought you were different” line was in response to Margaret dismissively playing, in her words, “the world’s smallest violin” just for Charles. Very good episode. All of the plotlines work nicely. The Double Cranko scenes are especially funny. Inventing a game like that shows how some people cope with being bored out of their minds. The drunken sergeant is very amusing. Ronny Graham was a very funny and talented guy. 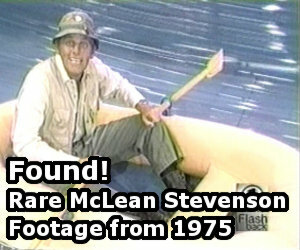 He collaborated with Mel Brooks on many things. 1) AB- blood is very rare (around .6% of the population), but would it have been so hard to find a donor? According to Wikipedia, peak US strength during the war was about 327,000. If my math is correct, that means around 2,000 Americans with AB-, not to mention all of the ROK and UN military (I don’t know whether or not they took donations from the civilian population.). Besides, didn’t Klinger have AB- blood in a different episode??? I know that Charles had it in “Life Time”. 2) During the first Double Cranko scene, Hawkeye and BJ are clearly drunk. Wounded arrive shortly thereafter, and they magically appear to be sober. Other than that, a fine episode. That’s what I was thinking during the episode; I thought I remembered Charles having AB- blood in Life Time. Another thing that bugged me about this otherwise solid episode was that once again Margaret managed to have her own tent despite literally everyone else, even the Colonel, have to double and triple up. They apparently used part of her tent to stack the stuff they took out of other rooms. That’s ridiculous because all that stuff could have been left outside and/or put somewhere else. By all rights she should have bunked with the nurses the way she did the last time this happened. I realize she’s a major and head nurse but still “just” a nurse after all.